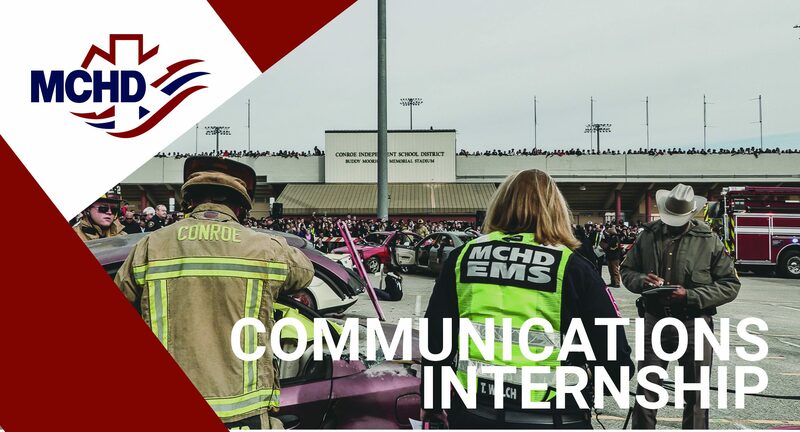 CONROE – The Montgomery County Hospital District (MCHD) is offering summer, spring and fall internships for communication students interested in pursuing a career journalism and public relations. We have multiple openings and will provide students the opportunity to learn in all aspects of digital communication in a newsroom-modeled environment. MCHD provides EMS services as well as indigent healthcare to the residents of Montgomery County. Medically, MCHD is a pacesetter and innovator in EMS practice. The Public Information Office tries to be progressive in its coverage, which includes professional-quality videos, out-of-the-ordinary social media campaigns and an emphasis on quality press releases and feature stories. Interns will have the opportunity to ride in ambulances, go to community events as a company representative and sit in on board meetings of one the largest government entities in the fastest-growing city in the United States. Interested students should have experience in AP Style writing or strong copy-editing skills. Students with video and photography backgrounds and portfolios are also encouraged to apply if interested in learning AP Style and becoming a well-rounded storyteller. An interest in social media and the ability to meet deadlines is a must. Students will be working on producing content that will be published weekly to build their portfolios. This is not a busy-work internship. Interested students should send a cover letter, resume, 2 letters of recommendation and 3 clips (either writing, photography, video, copy editing or social media posts) to celliott@mchd-tx.org. This is an unpaid internship.